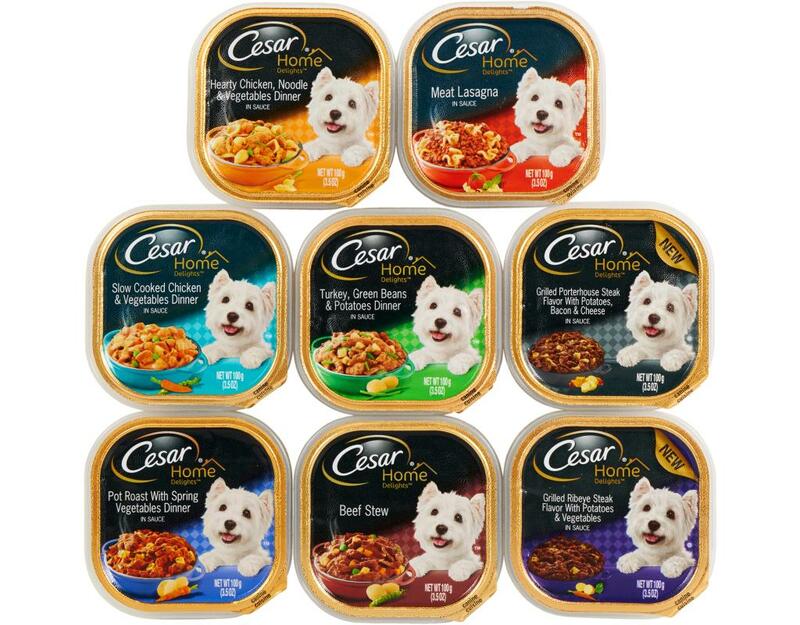 With home delights, Cesar borrowed the recipes families love most and made them just for your dog. 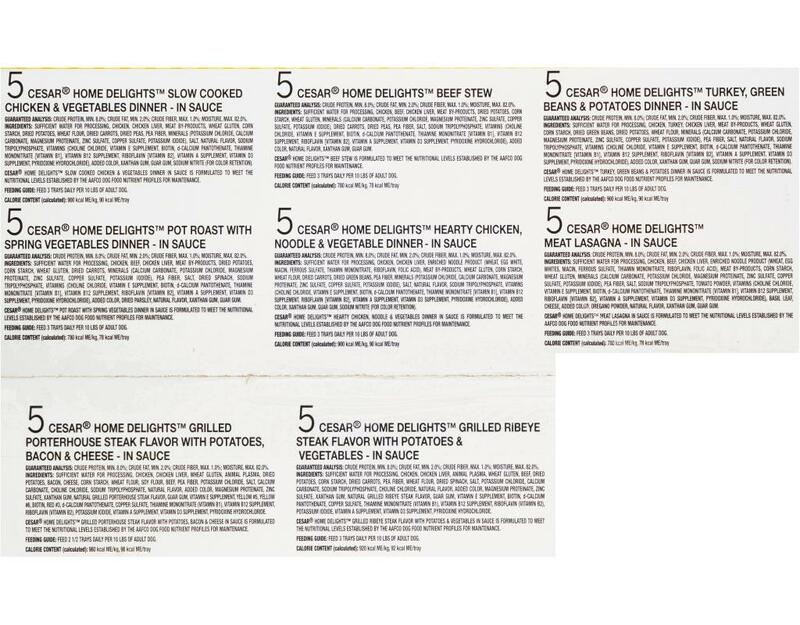 With irresistible combinations there’s a variety of dishes you’re sure to recognize, and they’re sure to love. • Slow Cooked Chicken & Vegetables - Dogs are great at catching tennis balls, but they aren't great at slow cooking chicken. 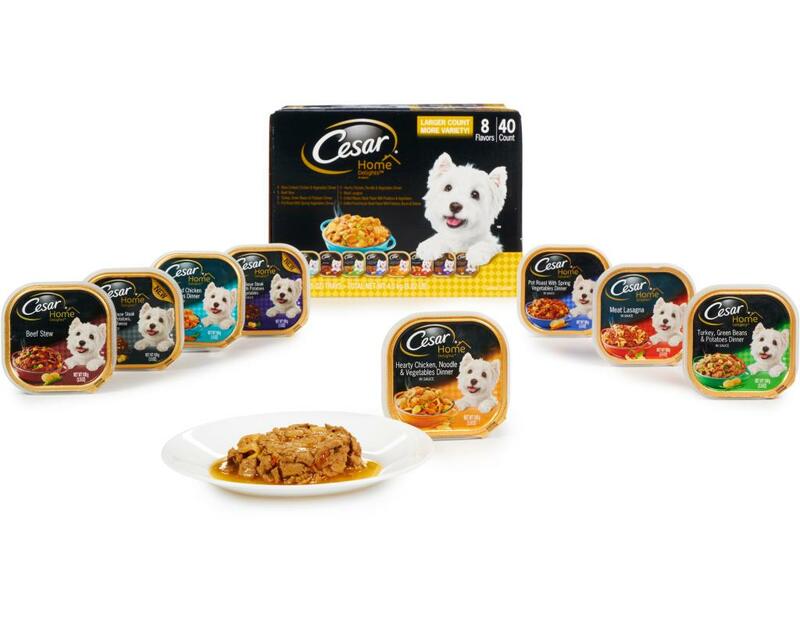 That's why Cesar simmered their chicken entrée, adding vegetables such as potatoes, and healthy carrots and peas for your pooch to enjoy. 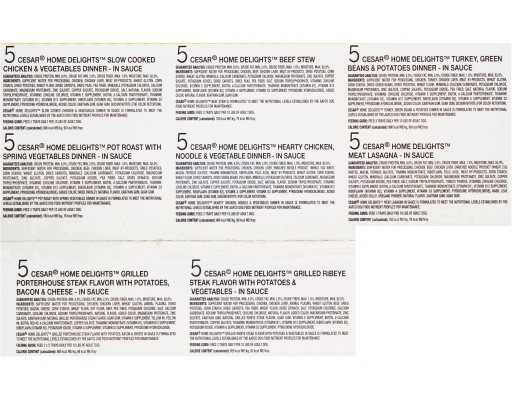 • Beef Stew - A dog that doesn't know the taste of beef stew is like a dog that doesn't know the taste of tennis ball. That's why Cesar made this meal of slow cooked meaty chunks and potatoes just for them. • Turkey, Green Beans & Potatoes - Some dogs like long walks. Others like little sweaters. But one thing all dogs like? Being treated like family. And what says family more than roast turkey, tasty potatoes, and veggies smothered in a hearty sauce? • Pot Roast With Spring Vegetables - Who doesn't love a good pot roast? 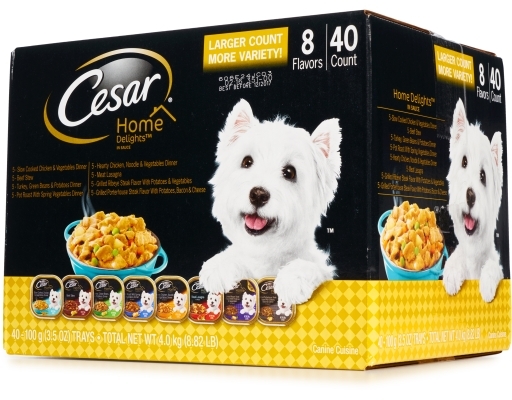 With meaty chunks slowly stewed for maximum flavor and a touch of parsley, every ingredient gets a "tails up" from your furry foodie. 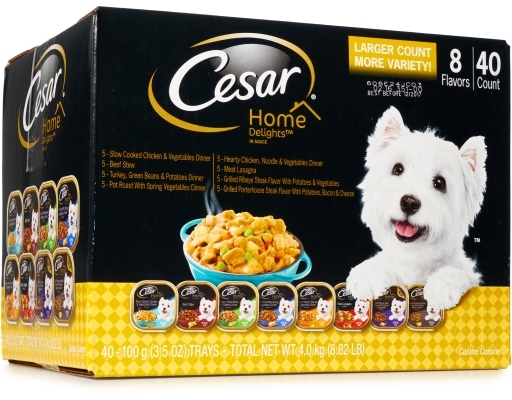 • Hearty, Chicken, Noodle & Vegetables Dinner - Even dogs need comfort food. 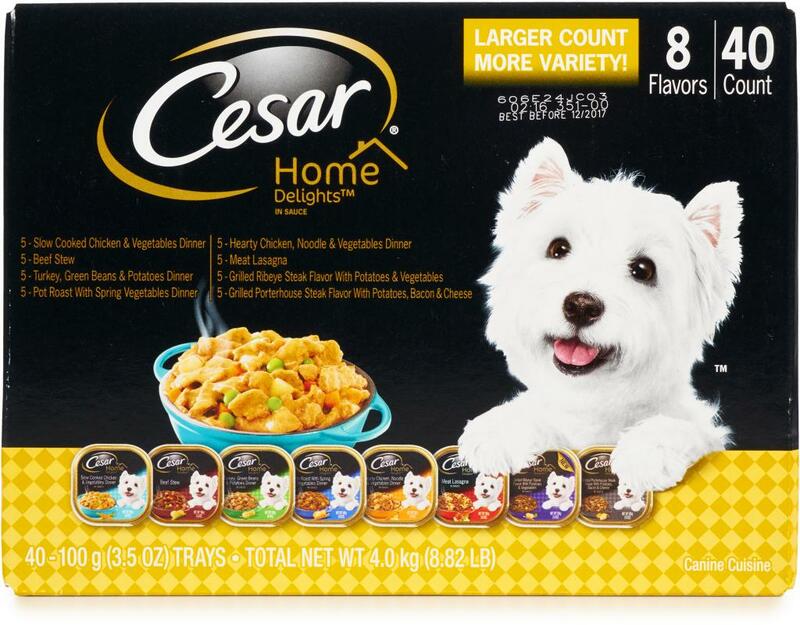 After a long day of chasing and playing, this slow baked dish with real chicken, noodles, and veggies makes your dog feel like new. • Meat Lasagna - Your dog doesn't have to be from the old country to enjoy an old favorite. With wavy pasta pieces and meaty chunks this scrumptious entrée might make your dog bark something in Italian. • Grilled Ribeye Steak Flavor With Potatoes & Vegetables - Your furry friend is going to fall in love with this tasty dish. What’s not to love when you’re talking about the flavor of Grilled Ribeye Steak perfectly paired with potatoes and vegetables. • Grilled Porterhouse Steak Flavor With Potatoes, Bacon & Cheese - The only thing better than belly rubs? The great taste of porterhouse steak. The only thing better than that? Adding potatoes, bacon and cheese to it! Yes please.